The Thompson Edgewood Chrysler Dodge Jeep RAM Dealership is proud to bring you its most welcomed addition to their showroom floor with the 2016 Jeep Wrangler Unlimited. The Unlimited is a full-size four door SUV that provides the best features with up to eight different trim models to select such as the Sport, Black Bear, Rubicon, and the Sahara. The SUV offers the best performance with its under the hood features and interior/ exterior applications to provide the segment with nothing but the best. 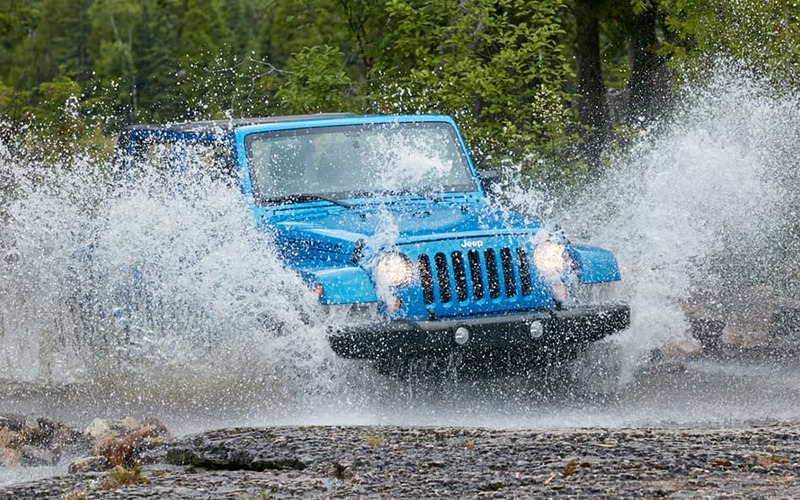 It's no wonder why Jeep is known for and has given the Wrangler Unlimited a Trail Rated Tough Seal of Approval. The Unlimited brings the best to under its hood with power, performance and state of the art features. The 3.6-Liter Pentastar V6 Engine is the top award-winning engine that makes the difference for the performance and power. The Pentastar is constructed with Aluminum deep-skirt block and aluminum alloy heads, with a W5A580 automatic five-speed transmission that helps push power with 285-HP @ 6,400 RPM and 260 ft-lbs of torque @ 4,800 RPM. The Pentastar also comes equipped with towing offering a maximum of 3,500lbs and a payload of 890lbs that is supported with its amazing suspension feature. With the fuel efficiency of the segment offers enough fuel on its 22.5-gallon tank offering 16-city/21-highway MPG on a total range of 360-city/473-highway total miles. Under the SUV comes its four-by-four system that gives the best-in-class suspension for off the road with its Rock-Trac system. the Rock-Trac system gives more control and more torque, the system is a go-anywhere system with a 4:1 low-gear ratio that lets you to crawl at a lower speed with a greater increase in torque at the wheels. The Wrangler Unlimited brings it best features to its inner and outer body with a selection from all four trim models. One of the offered models is the Wrangler Unlimited Willy Wheeler, the trim model offers 17-Inch x 7.5-Inch high gloss black wheel covers with BF Goodrich brand tires. Also equipped on the Willy Wheeler model comes with options of its sunroof tops such as the Freedom Top black three-piece hard top or the sunrider soft top, deep tint sunscreen windows, two hooks on the front bumper and rear bumper, removable doors, side steps, skid plates under the body, and a full size spare tire to let the great outdoors know who's in charge. The interior of the SUV comes with five-passenger seating with 60/40 folding capabilities. a hard cloth fabric for the seating with a hard case side interior, all weather slush mats, base interior accents, cargo compartment floor mat, chrome/leather wrapped shift knob, and its signature Uconnect Access Technology System. How do I apply for a Finance Application? Where is Thompson Edgewood Located? We are located at 1102 BUSINESS CENTER WAY. EDGEWOOD, MD	21040 Directions! What other Jeep models do you offer? The Jeep brand makes safety its top priority with a boatload of safety and security features to select from. Offering its standard airbags, the SUV also comes packed with features such as electronic stability, Sentry Key Theft Deterrent system, traction control and much more. 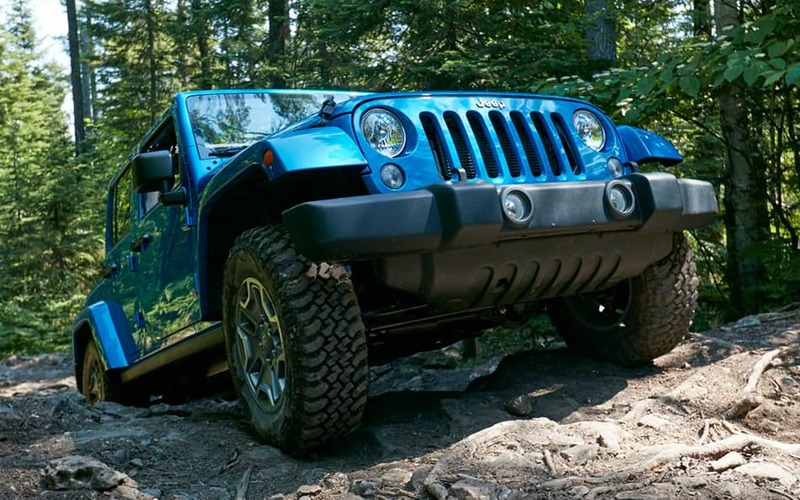 The Jeep Wrangler Unlimited is one of the few outdoor SUV's that's worth the purchase for 2016 with its off-road capabilities, along with its interior and exterior features. Making it Trail Rated Tough worthy.